Two or so years ago, Kristina Fong, the Walker’s Marketing and Audience Research Coordinator, was handed the keys of the Walker’s social media accounts and, ultimately, a new title: Digital Marketing Associate. At that point, social media at the Walker meant accounts on Twitter and Facebook. 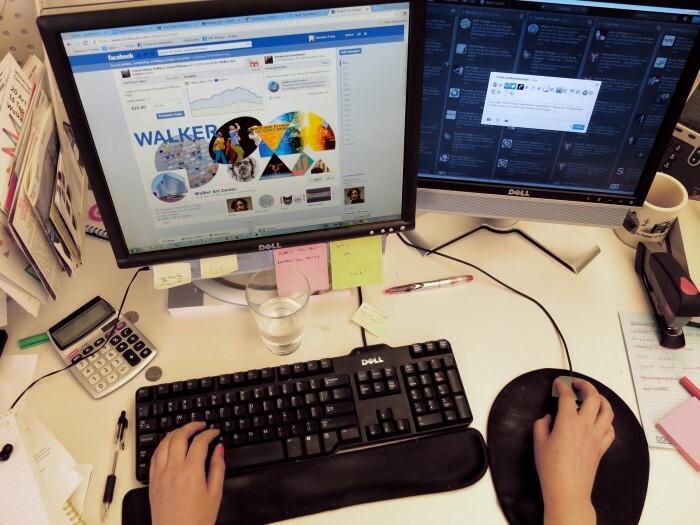 Today, the Walker has 374,000 Twitter followers, 49,000 Facebook likes, 13,000 Tumblr followers, 8,800 Instagram followers, and a presence on other platforms, including Pinterest and Storify. 1. Know your museum, know it well. This is more important than knowing how to use TweetDeck, HootSuite, Instagram, Statigram, Facebook Pages, Google Analytics, etc etc. If you don’t really, I’ll say it, love your museum, you are lost. You may not love everything about it all the time (I never fell in love with dance, or other types of programming I felt I ought to love, although I tried to understand it), but the most important thing about social media is being genuine. 2. Your social media person has to be a good writer. You’re writing every day and you have to relay your message in short, pithy statements. You have to have a voice. It’s also not a bad idea to make sure your person has written online somewhere. How does the internet talk? You should be fluent in that. Confession: I’m not a great talker, unless I’m really comfortable in a situation. Words feel more like my ally when my hands are creating them, not my mouth. Someone whose personality screams social may not be able to present that online. 3a. ‘Likes’ and followers matter (even though the opposite was probably the first thing uttered at the very first social media panel at a conference). Is it the end all be all? Of course not (especially if you’ve gotten cheap ‘likes’ by saying “If you agree with this obvious statement that everybody likes, click ‘like.’) But they matter because it’s a simple fact: you’re growing your audience. Tell me this, would you be worried if you suddenly lose 5,000 fans on Facebook? Or you just stopped at 10,000? Probably. They matter. If you’re getting likes, that’s a vote of confidence. When I post something that people really respond to, ‘likes’ go up. 3b. Caveat: If your likes go up and your engagement numbers also don’t go up (number of active comments and conversations), that’s a problem. That means you’re boring your new followers. You’ve got to grab them when they’re fresh—that means every day, since you’re getting new followers every day. 4. Talk to people. There’s a lot to strive for on social media: engagement numbers, responses, participation, qualitative data. But overall, they’re the exact same goals as our general mission statement and our website/blogs. Engage, ask questions, be a catalyst for critical thinking, connect. Be available. Build intrigue & trust—if those two things are possible simultaneously. I strive to make our audience feel like they can approach us and that in turn builds a positive relationship with us. (Think how much more you like a person you meet if they simply ask you a question, say your name, or turn to say something directly to you.) So that can be through direct conversations, yes, but also just by sharing knowledge (you get the exclusive) and giving people the opportunity to make a comment (you feel knowledgeable). 5a. Make it genuine. I know when I’m forcing a tweet. It’s burdened with edits and necessity. (Necessity = “you have to tweet about this poorly selling event or else!! !”) You also can’t be excited about everything. An institution is an entity online. We read these accounts because they’re one stream, as one being. So Walker is an entity that loves contemporary culture and thought, dance, music, visual arts, family programs, esoteric artists-in-residence, a restaurant, and a Shop, and everything related to those things. That’s a lot! But do you tweet about all the things you love all the time? No. You may have, say, 5 things going on the week. Some of them are big, some of them aren’t. You don’t talk about each with equal excitement. In your mind, you prioritize their importance and that’s what you communicate. 5b. A confession: I’m hyper-aware about the number of messages being sent out from each channel every day. Probably too much so. People don’t mind if you post several times on Facebook in a day, as long as those posts are spread out a little bit, but I’m very sensitive about it. You have to consider the reader’s feed, not just what you want to push out. I have tried, again and again, to stress the importance of “keeping it cool” to the various departments who have their own Facebook pages/Twitter feeds, and it does not always work. You may take 8 photos back to back, but you do not Instagram them all in a row. You may have a list of events to upload to Facebook, but you do not make them all in a row because every time you do, it shows up as another post on a user’s newsfeed. You see? You have to be aware of your mark. You have to look at the world outside your world. A few studies have declared that they have found the “sweet spot” of Twitter posts: 3. Or something. I forget. They say that engagement goes down after you tweet more than 3 times. This is null and void if you’re doing it right. 5c. What is doing it right? Paying attention to Twitter, what’s trending nationally, internationally (to a certain extent, don’t talk about pop stars in scandals), and within your sphere. That’s right. Follow influencers, follow places just like you, places you want to be like, the people who are talking about you, and share their information. You know very well that your museum is not a bubble. Thanks, Kristina, for everything. See you online.